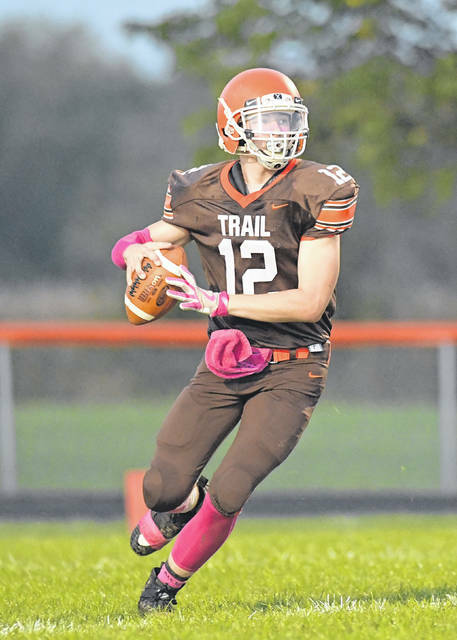 National Trail quarterback Evynn Short prepares to pass during the Blazers home game with Ansonia on Friday, Oct.5. Trail rallied from a double-digit deficit, but came up short, 20-17. NEW PARIS — With the game on the line, the Ansonia defense bent, but didn’t break in preserving a 20-17 win over National Trail on Friday, Oct. 5. The Tigers (5-2, 4-1 Cross County Conference) had possession of the ball with 5:58 left in the game holding onto its 20-17 lead, but the offense couldn’t get across midfield and was forced to punt with 2:22 showing on the clock giving the Blazers one final chance at a come-from-behind victory. Trail (3-4, 1-4 CCC) started at their own 34-yard line and the first play was an incomplete pass by Evynn Short, but Ansonia was flagged for pass interference which moved the ball to Trail’s 49-yard line and gave them a new set of downs. On the very next play, Ansonia junior Austin Helmke burst through the line for a 6-yard sack of Short putting them in a second-and-16 situation. Short converted a short 1-yard pass on second down and then threw an incomplete pass on third down setting up a fourth-and-15 desperation play for the Blazers. Short found Zack Woodall open for a 26-yard completion and a first down at the Ansonia 30-yard line. The Tigers defense rose up again tackling Short for a 6-yard loss on first down. The Blazers then used a trick play that didn’t fool the Ansonia defense and gained only 3 yards on a pass from Peyton Lane to Cole Yount. Facing third-and-13 situation with under a minute in the game, Short threw an incomplete pass, but Trail was flagged for offensive pass interference moving them back 15 yards and repeating third down with 25 yards to get a first down. Short connected with Yount for 22 yards to the Ansonia 25-yard line leaving them a fourth-and-3 to go situation. A 7-yard run by Short put his team on the 18-yard line with a first down, but with time running out there was just enough time left for one final play. Short took the snap and ran around looking for an open receiver but his last second pass fell incomplete and the Tigers held on for the win. Though it was early in the drive, Helmke’s quarterback sack – his first of the season – was a key play in preserving the victory. Ansonia held a 7-3 lead at halftime. It was Trail that struck first with a 34-yard field goal by Colton Toms at the 10:04 mark of the second quarter. But Ansonia answered on the very next play as Reece Stammen returned the kick off 79 yards for a touchdown. Michael Hall’s extra-point kick made it 7-3 for the Tigers and that’s where it stood at the break. Ansonia had first possession coming out for the third quarter and made a statement type of drive starting on their own 37-yard line and driving 63 yards on 11 plays using nearly 5 minutes off the block capped by a 1-yard touchdown plunge by Stammen and a 14-3 lead. But Trail wasn’t about to give up. The Blazers had good field position at the Ansonia 44 to start their next drive and needed only three plays to reach the end zone on a 36-yard pass from Short to Woodall cutting the lead to 14-10. 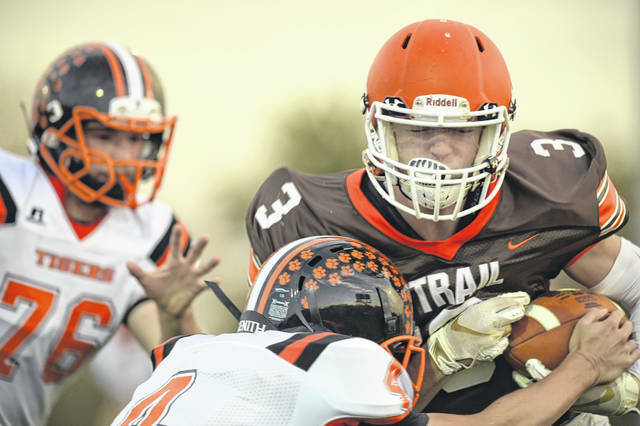 But the Tigers had an answer of their own with a 10-play drive on their next possession that covered 62 yards capped off by a Brock Shellhaas 6-yard touchdown run. A two-point conversion pass failed leaving the lead at 20-10. On the third play of the fourth quarter, Short took it in himself from 2 yards out for National Trail and the Tigers lead was down to three, 20-17. 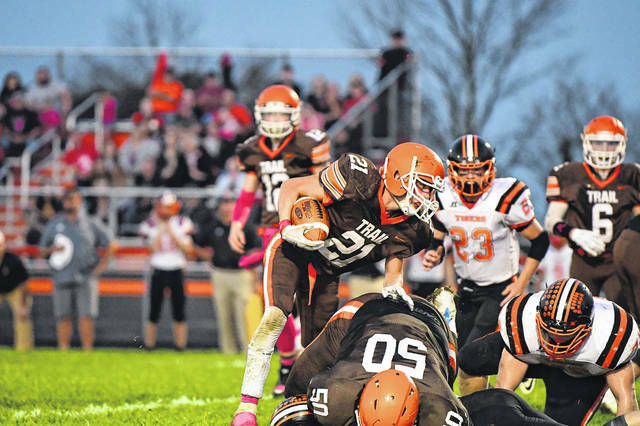 Shellhaas led the Tigers ground attack with 104 yards rushing on 14 carries and a touchdown. Stammen carried the ball 23 times for 99 yards and a touchdown. He also had the 79-yard kick return for a touchdown. Hunter Buckingham completed 4-of-6 passes for 36 yards, two each to Matthew Shook and Hunter Muir for 18 yards apiece. Trail coach Mark Hoffman expressed disappointment after the tough loss. https://www.registerherald.com/wp-content/uploads/sites/41/2018/10/web1_ntfb1.jpgNational Trail quarterback Evynn Short prepares to pass during the Blazers home game with Ansonia on Friday, Oct.5. Trail rallied from a double-digit deficit, but came up short, 20-17. Reach Skip Weaver at (937) 569-4316 or by email at sweaver@aimmediamidwest.com. You can also follow him on Twitter at @skipweaver65.